As a child, I remember snippets of him. Always said in a hushed whisper. I was too young to understand the whispers were said in reverence. I remember his picture on the wall and learning, over the years, just who that handsome young man was. Morris, Uncle Soren and Aunt Nora’s son, Dad’s cousin, Grandma and Grandpa’s nephew, lost in the war. Like many of their generation, they rarely spoke of him. Too painful. Dad would shake his head and leave the room. But that picture .. it remained on the wall. And every year when Dad and others attended Remembrance Day ceremonies and helped place the wreaths in memory, I think he was there. He became more than just the man in the picture on the wall. LEST WE FORGET the man in the picture on the wall. 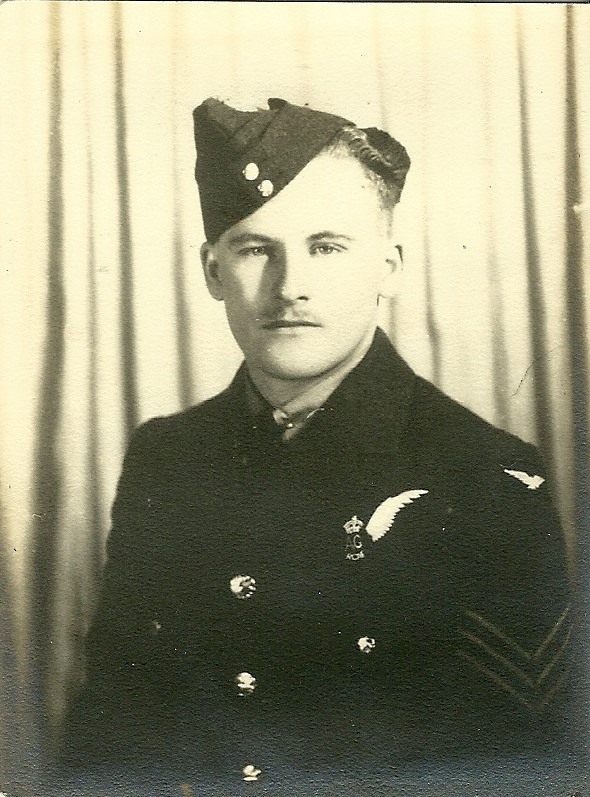 Pilot Officer Air Gunner Morris Soren Forsberg. Killed in Action June 6, 1944. Buried in Brookwood Military Cemetery, Woking, Surrey, England. An Emjayandthem (C) photo. You honor him remembering him on this day seventy years after he was taken. And your family lovingly remembered him every day and honored him by hanging his picture on the wall. War is very close. And the picture .. it’s still on the wall. There are many beautiful poems and songs written about the insanity of losing young people to war. When it strikes a family, no one ever forgets. So young…. war is a horrible, horrible thing….tearing apart families. Agreed; necessary at times but not without its sacrifices. There is no finer tribute than to honor one, for if you honor one, then you honor all. Thank you, I think so, too. Yes, I agree. You honor him by sharing him with us. Happy Veteran’s Day, MJ! Mj could you get back to me please.